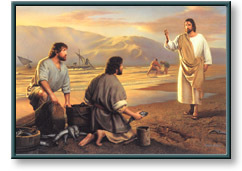 Jesus calls two fishermen to follow Him, saying that He would make them Fishers of Men. And he saith unto them, Follow me, and I will make you fishers of men. And they straightway left their nets, and followed him." Framed Size:................... 24.75" x 31"
A 14" x 20" print comes deluxely framed and matted in a dark wood frame. Fishers of Men copyright © 2001 by Simon Dewey is prohibited from being copied.